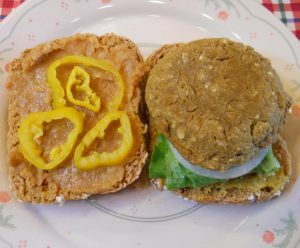 This chick pea burger is a quick and easy recipe (about 30 minutes to be ready to serve), providing the chick peas have been precooked. This recipe will make eight burgers as shown in the photo. If you have a powerful food processor, all the ingredients can be added to the container with the bottom cutting blade and run on high speed until smooth. It may take some stopping and spoon mixing to get everything to blend in properly if it is not powerful enough. An alternative method is to place all the ingredients, except the flour and oats, into the container of a high speed blender, cover and run the blender at high speed until all the ingredients are smooth. Place the whole wheat or spelt flour and oats in a mixing bowl and add the ingredients from the blender and mix well to ensure that everything is uniformly mixed together. If the chick pea burger mixture is not stiff enough to make form a burger, add an additional tablespoon of flour and oats and mix again to obtain the desired thickness. Repeat if necessary. We like to use a round “ice cream” scoop to form the burgers, because it helps make uniform sized patties. If you are planning to bake the chick pea burgers, place the 8 scoops of the chick pea burger mix in a 9″ X 13″ glass baking pan arranged as the symbols on an “8” playing card. If there is any left over mix, place a little extra on each of the scoops, and then flatten them into patties as shown in the photo. If you are planning to cook the burgers on a grill, it is best to place 4 scoops of the mix on each of 2 square pieces of wax paper and flatten them as above, and place each set of 4 burgers on a plate and place the plates in the refrigerator for 30 to 60 minutes before you plan to grill them. This will firm the burgers and make them easier to cook on a grill. The chick pea burgers can be baked in the microwave oven on high heat in about 10-12 minutes, or they can also be baked in a conventional oven in about twice the time at 350 degrees F. Check them for firmness to ensure they don’t over cook. The patties can be eaten as is, or they can be placed on a bun or roll in a traditional burger manner with your favorite fixings.